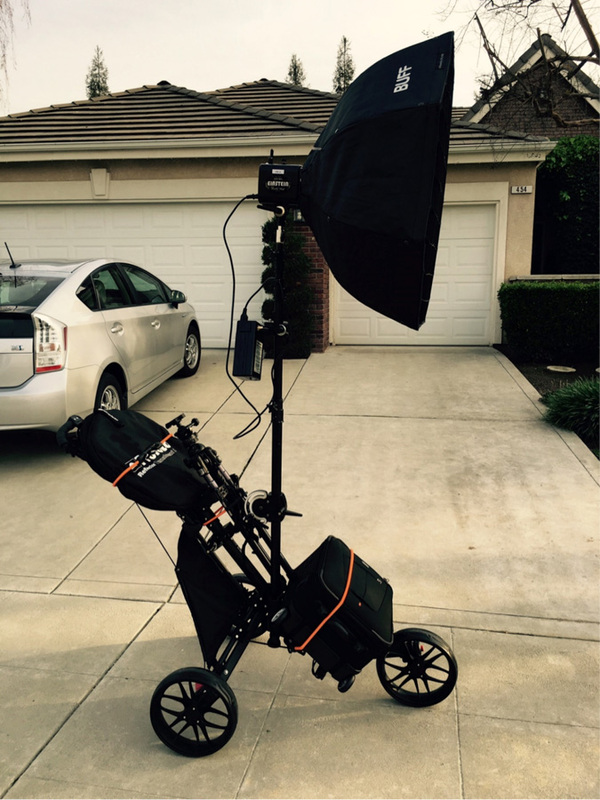 It’s been about 6 weeks or so since I’ve had my Golf Cart Light Stand, and I wanted to share my experiences so far. During an engagement shoot last month, I thought I’d use a 42″ umbrella instead of my usual 28″ octobox, just to get a little softer lighting. There was a wedding shoot at the same location, so I wanted to make sure my couple and I didn’t get in their way, so I had the couple move over to a location on a slightly bumpy area of grass. 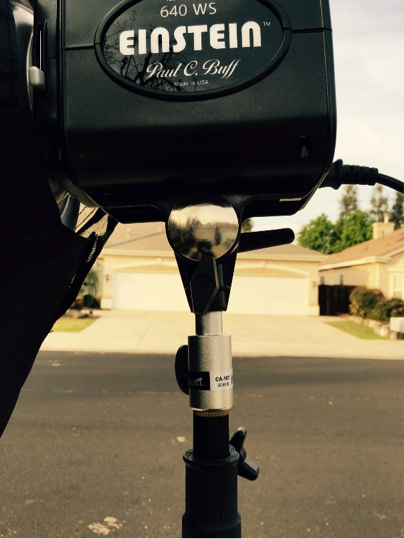 I needed to park the light stand on a slight incline and put on the brake. It was getting a little gusty but I thought the brake would keep the cart from rolling back. Well, the brake did hold, but the wind caught the umbrella and pushed the cart back enough to tip it backwards. The handle hit the grass, and the force of the fall bent the top part of the stand that was close to where the light was mounted. Nothing broke and I was still able to continue using the light stand. However, I was unable to contract the stand because of the bend, and I had to wheel the cart with the stand in the most extended state. This of course swayed the light as I was moving the cart around. 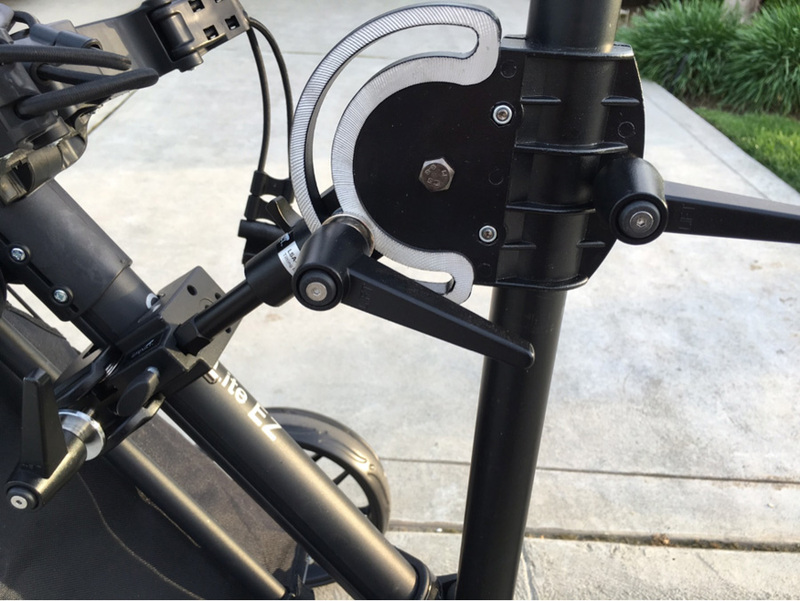 Back at home, I was able to take apart the retractable light stand (actually a reflector holder) quite easily by taking out a couple screws, and was able to straighten the bent top post. But this experience led me to think of how I could make this cart a little more stable. 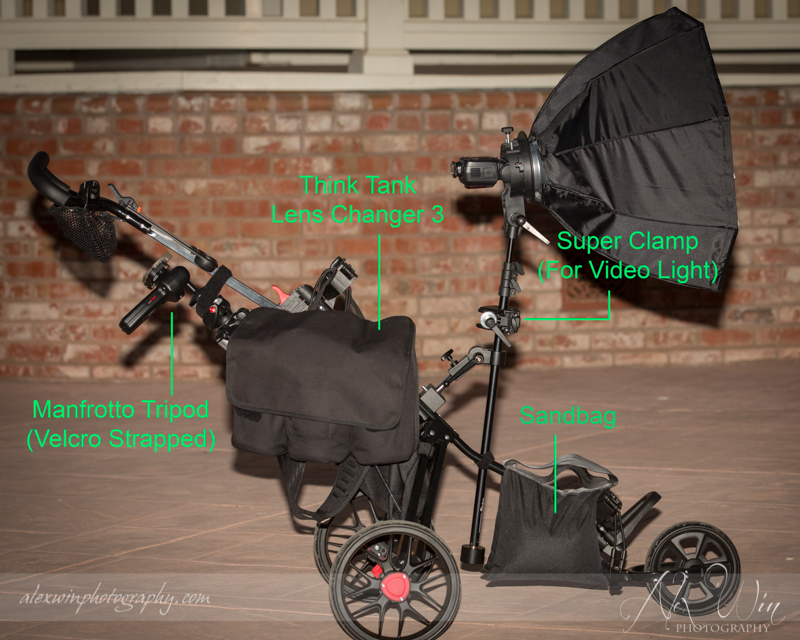 I had noticed that just a few lenses and a flash in my bag was not heavy enough to keep the cart stable in a strong wind environment. Also, I typically carry my tripod with me — a medium-weight Manfrotto which tends to put more weight towards the handle as I velcro-strap it to the shaft, making it a little heavier for the camera bag to counter on the opposite end. So what I did was re-introduce the sandbag that I’ve been trying to avoid back into the solution. Instead of using the camera bag to act as a ballast, I now hang a 15 lb. sandbag there instead. And my camera bag has been replaced with a Think Tank Lens Changer 3, and I just hang it off where you would strap the top of a golf bag. 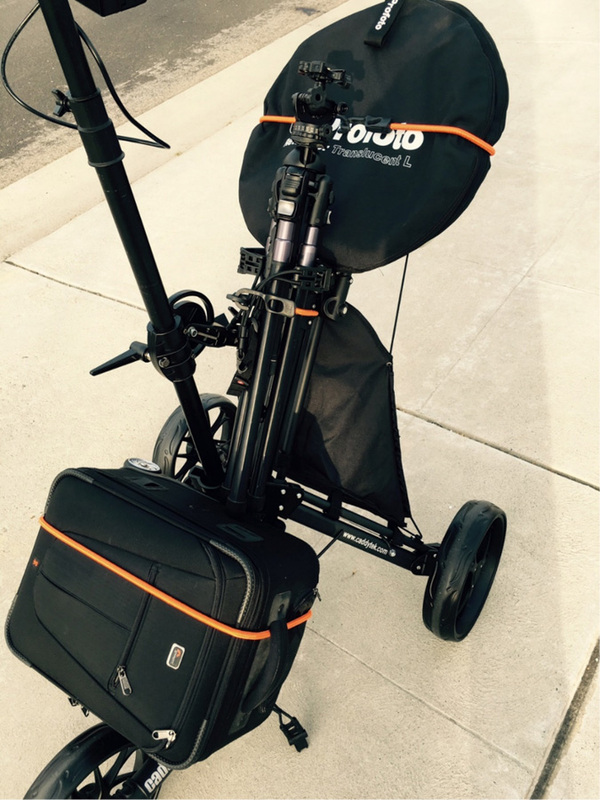 There’s several advantages to doing this — (1) the heavier sandbag keeps the cart more stable, (2) the lens bag puts downward pressure towards middle of the cart, again keeping the cart more stable, and (3) the lens bag which is now placed higher is easier to access. 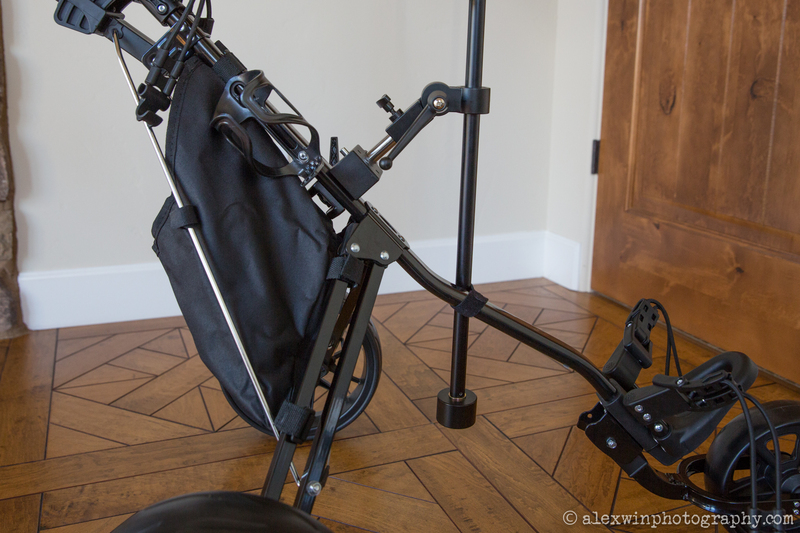 The addition of a sandbag does add one more step in the setup of the stand, but you still don’t have to lug it around since it’s always on the cart. 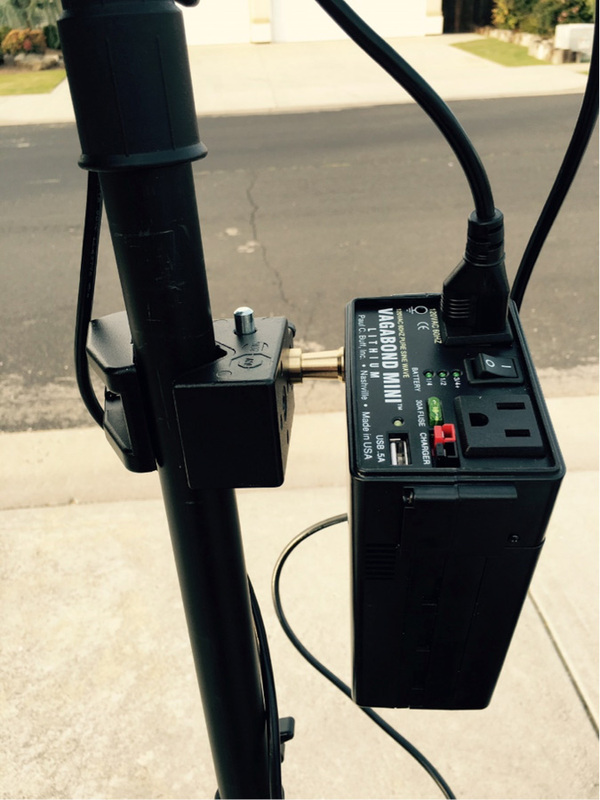 I’ve also added a 2nd Super Clamp to the post where I can mount a video light. This comes in handy in darker environment where focusing may be a problem, or to use in a situation where a flash may be too strong. 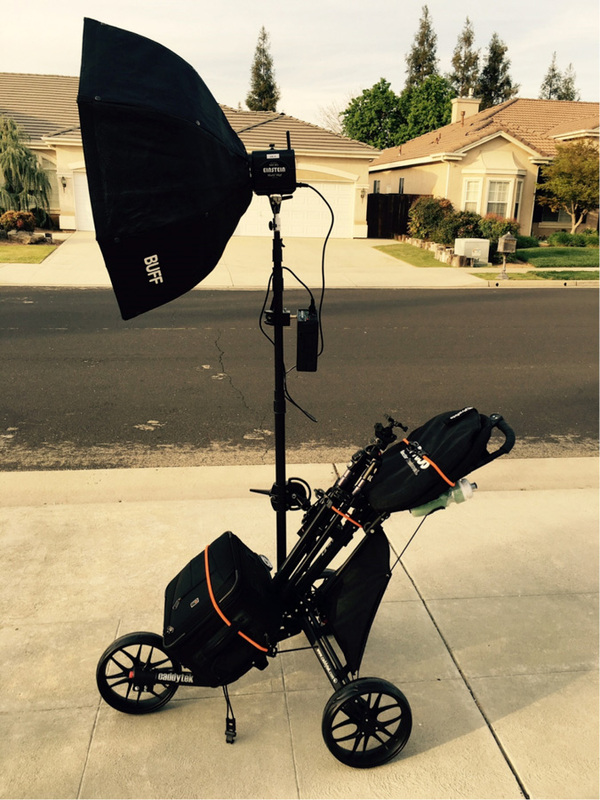 I was finally able to take the Golf Cart Light Stand out for a little testing yesterday. 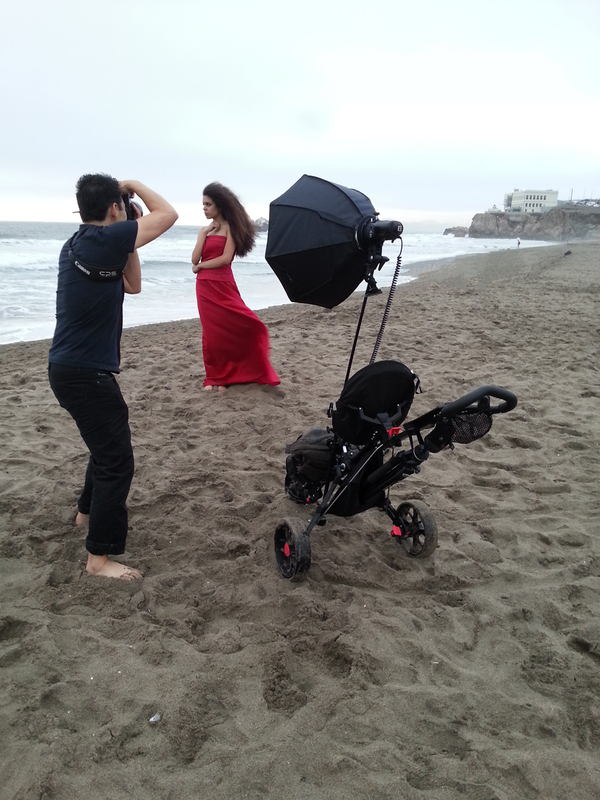 Perfect testing environment — a no-pressure model shoot on a typical summer blistery cold and windy San Francisco beach. Here’s a pull-back shot of me with the light stand. Sand doesn’t quite make for an even surface, so I was able to stress the light stand at various non-level angles. 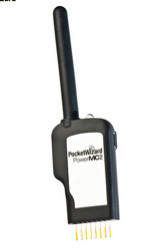 Portability — great. 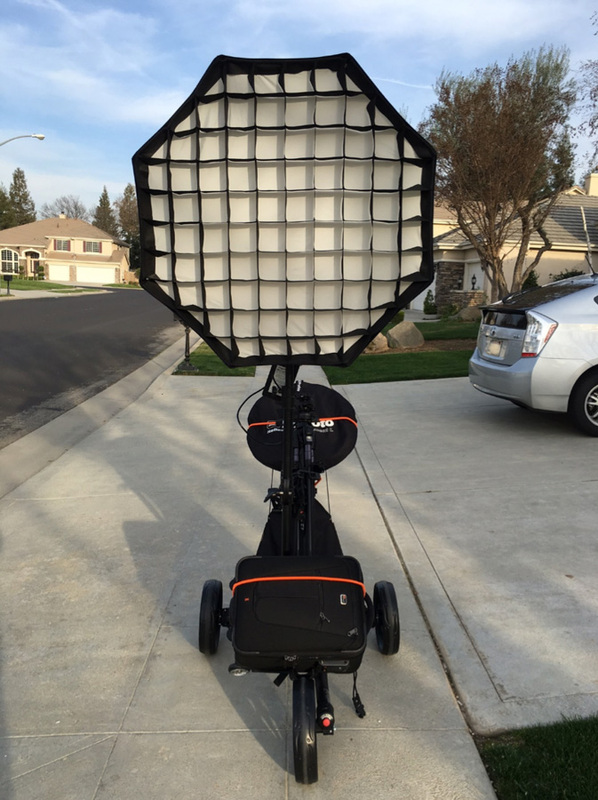 I was able to take it apart two sections (lightstand and softbox from the cart) very easily. 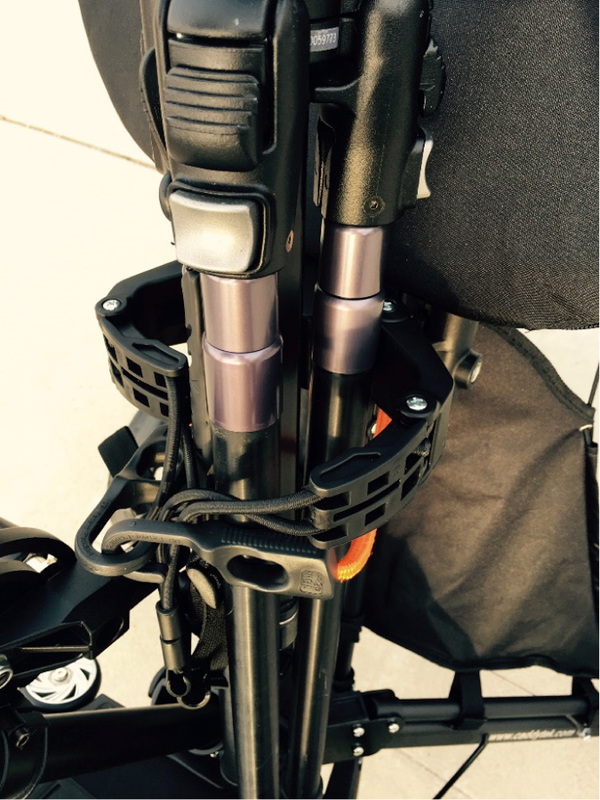 The cart folds up into about 24″ x 34″ and it’s fairly light (about 11 lbs) because it’s mainly aluminum. I think it took me about 3 minutes to put it together from the car. 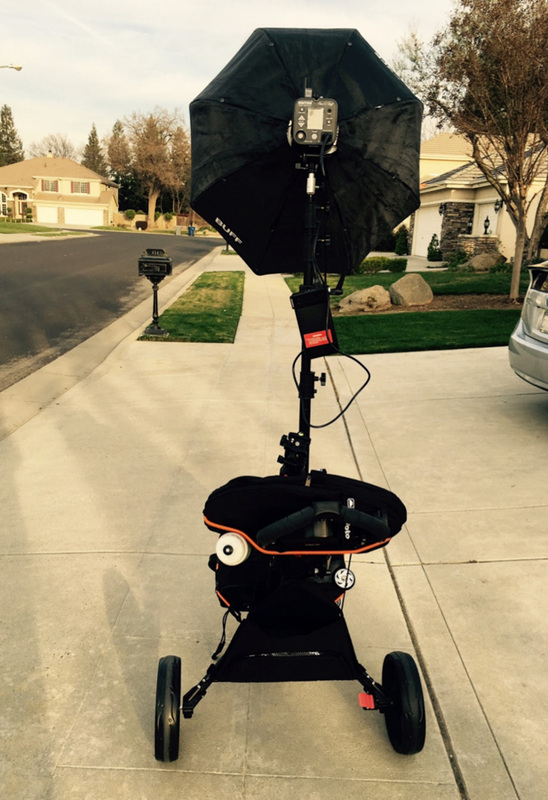 First you expand the cart, put the camera bag on, secure the lightstand with a thumbscrew, and then secure the softbox with a thumbscrew. 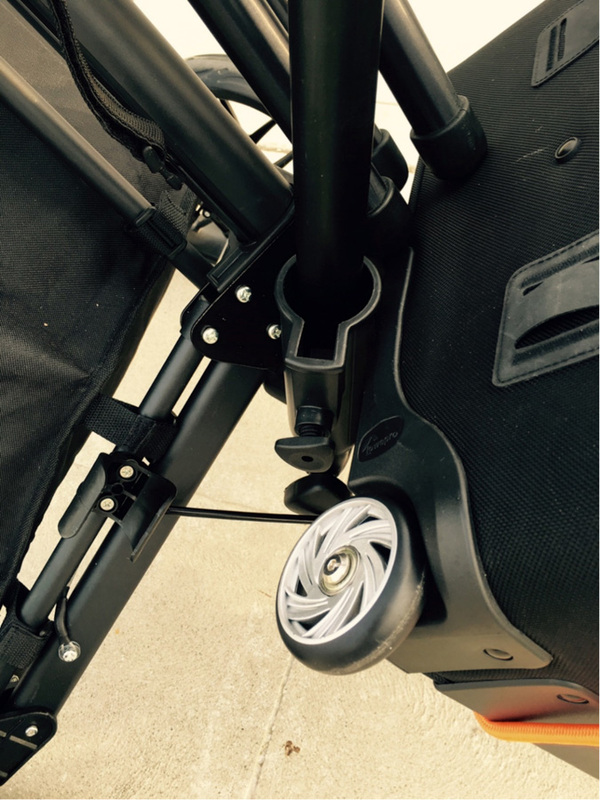 Manueverability — The cart, when the wheels are extended all the way out, is slightly narrower than a width of a standard doorway, so I had to be careful going through doorways as I pushed it out from my house, but there was no problem fitting through them. On the beach, I had expected the wheels to skid or dig into the sand, but they rolled along fine. As with anything in the sand, you do still have to fight it when pulling and forget pushing. I’m guessing I had about 35 lbs, including the cart. That said, on flat ground, it was a piece of cake to push and turn. Stairs — I didn’t expect stairs that I needed to go down to the beach, but it was a good test. I had someone help me going down, but I was able to pull it up one step at a time without any problems. In hindsight, I’m pretty sure I could have pushed it down one step at a time without any problems. 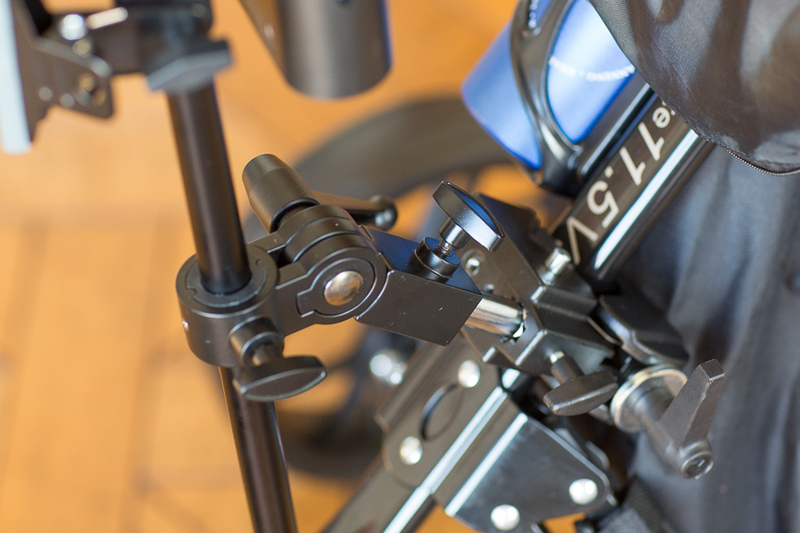 It helps to make sure the lightstand is contracted all the way to keep the center of gravity towards the middle. 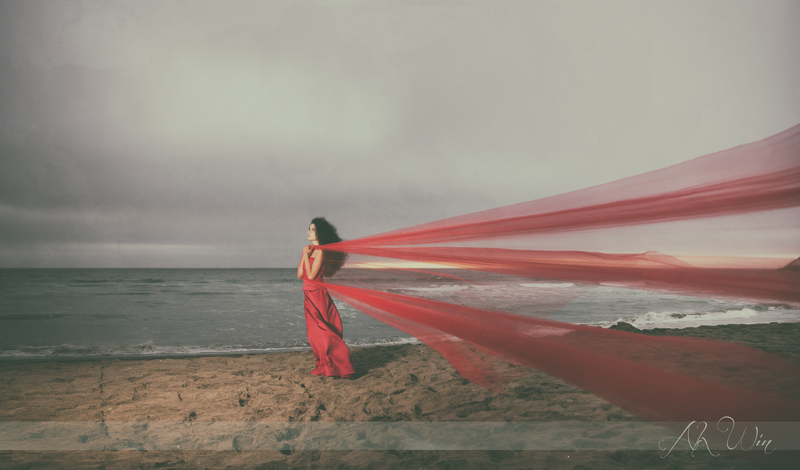 Stability — the wind was kicking up quite a bit, and the softbox swayed, but the cart did very well. There was one time that I had the cart sitting slightly at a sideway angle and had to catch it when the wind caught it, but that was more my fault for not keeping the cart more level. Other than that, the weight of my gear bag was good enough to keep it steady. So my advice here would be to make sure the softbox is at the center of gravity as much as possible, especially when it’s extended up. Practicality — Throughout the shoot, everything except my camera was on me as you can see in the photo above. Everything else was in my camera bag which was acting as a sandbag. I was also carrying a 8 lb. 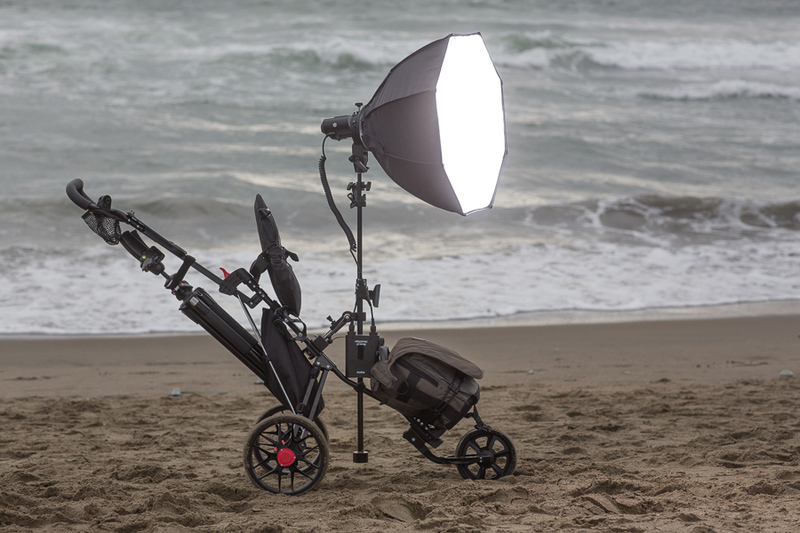 tripod (with head) on the cart as well (you can see it strapped to the shaft of the cart in the photo above), so imagine having to carry around lightstand, tripod, camera, camera bag, and sandbag around separately a pretty large beach. I didn’t have to do multiple trips to the car and I really didn’t need any help. I do find it easier to push it around in the wind when I contracted the lightstand to keep the center of gravity low, especially on sand. But I didn’t find it to be a hassle at all doing that. Once I got home, I took the cart and hosed down the wheels, and everything looks as good as new! This is a quick how-to on making your own portable light stand that’s built on a golf push cart. The inspiration of my design is based on the original by Peter Nguyen, and a follow-on by Joseph Philbert. 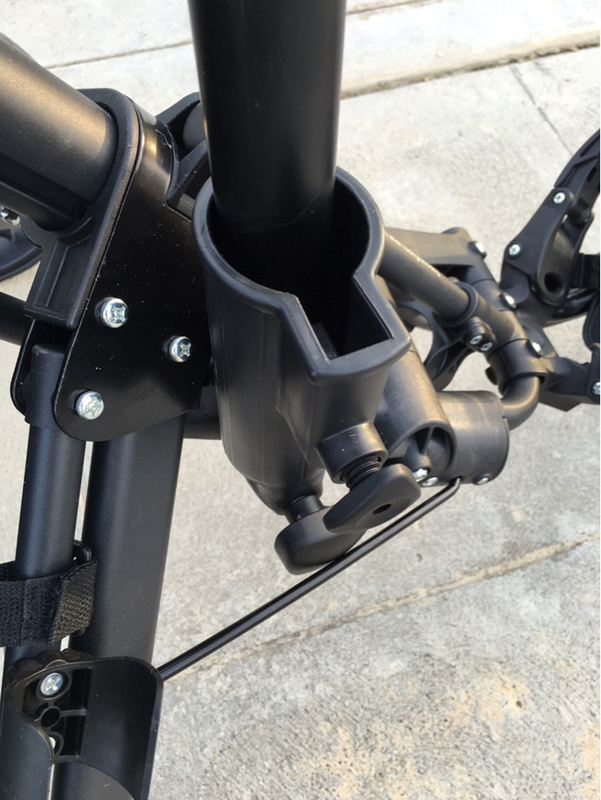 Both these solutions were based on the Bag Boy brand of golf push cart and requires drilling a hold to clamp the light stand to the golf cart shaft. 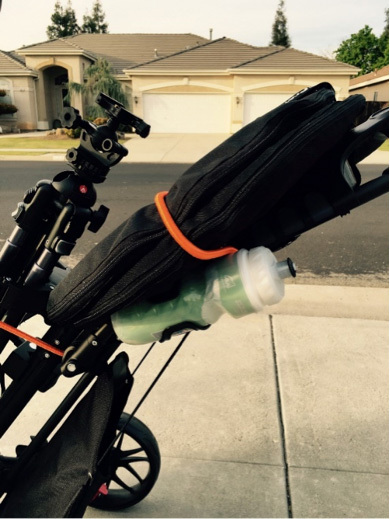 There was also a similar solution (sorry, lost the link) using a CaddyTek SuperLite Deluxe Golf Push Cart . 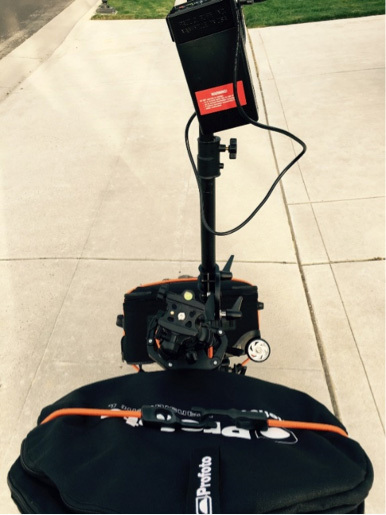 My solution is based on last design using the CaddyTek SuperLite Deluxe Golf Push Cart. This cart can be bought from Amazon for a fairly reasonable $80. 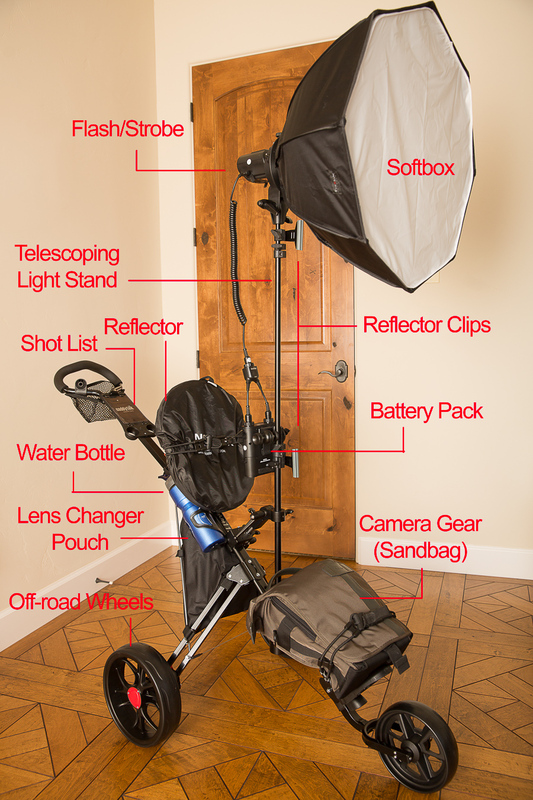 The total cost of parts for this DIY solution — about $170, of course, not including the light, battery, softbox, gear bag, reflector, and water bottle. 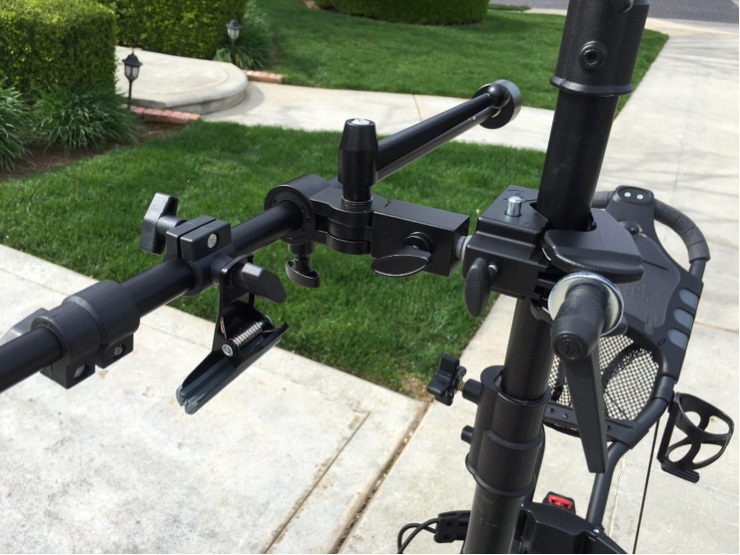 My solution uses the Impact Telescopic Collapsible Reflector Holder for the light stand. 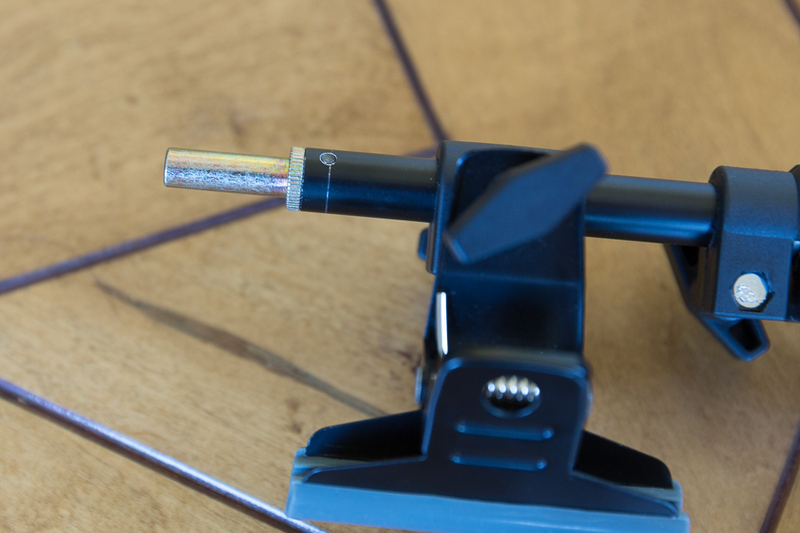 The tip is 3/8″, not the usual 5/8″ found on typical light stands. But this seems to work fine with my speedlite adapter and my Einstein strobe. I’ll refer to this reflector holder as a light stand from now on. 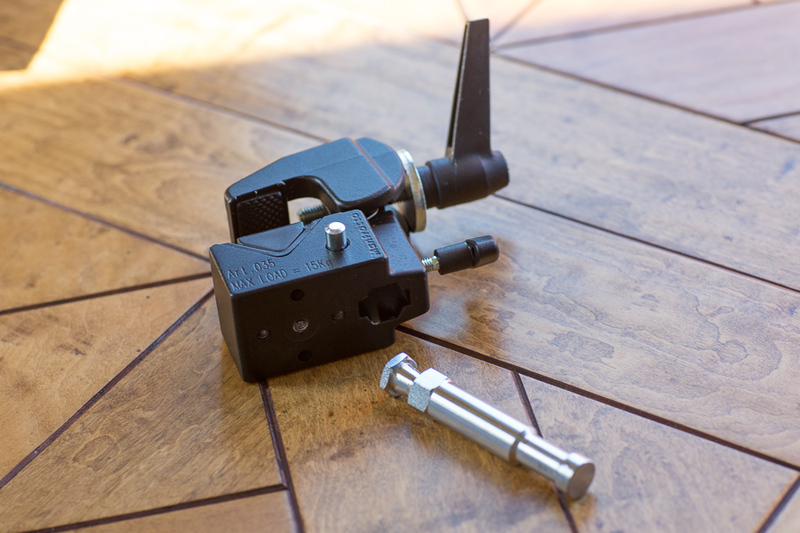 Next, you’ll need the Manfrotto 035RL Super Clamp along with the Avenger E600C 5/8-Inch Snap-In Steel Pin for Super Clamp. 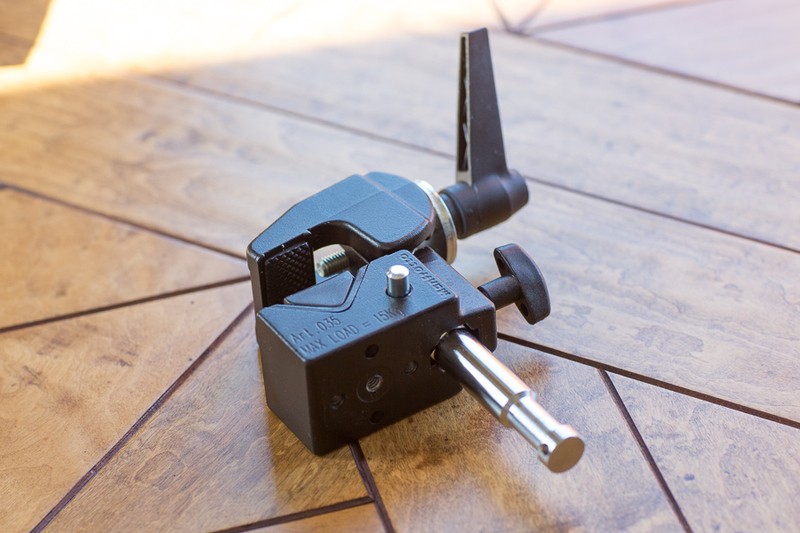 The Superclamp comes with a little wedge that can be placed in the jaw to clamp onto a flat surface. Make sure that wedge is in place. 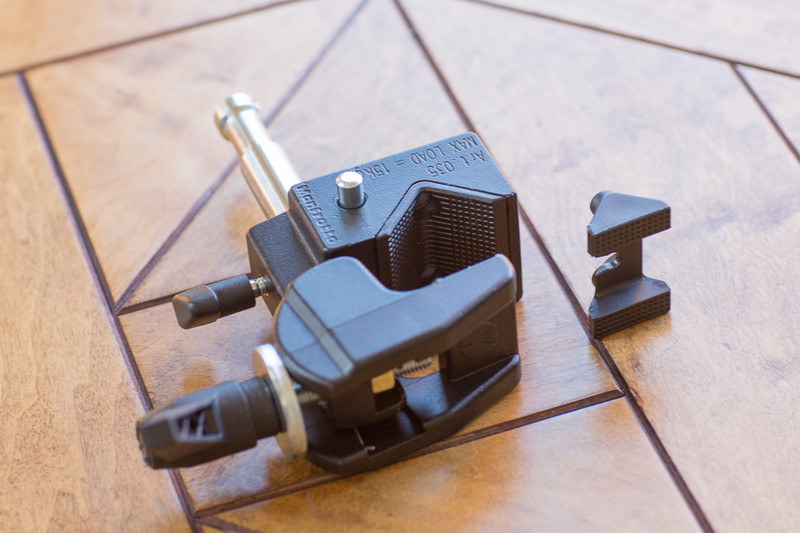 The above photos show it in place, but it doesn’t come pre-connected to the clamp. Here’s how the wedge looks separated from the clamp. 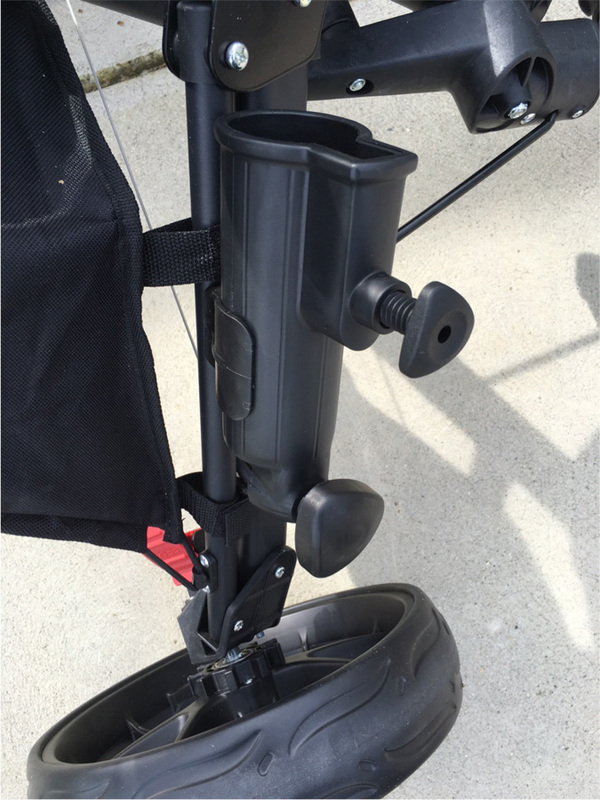 Before connecting the clamp to the golf cart shaft, stick a strong velcro to the top and bottom of the shaft where you’ll put the clamp. I use the Velcro Brand Industrial Strength Tape-Black . 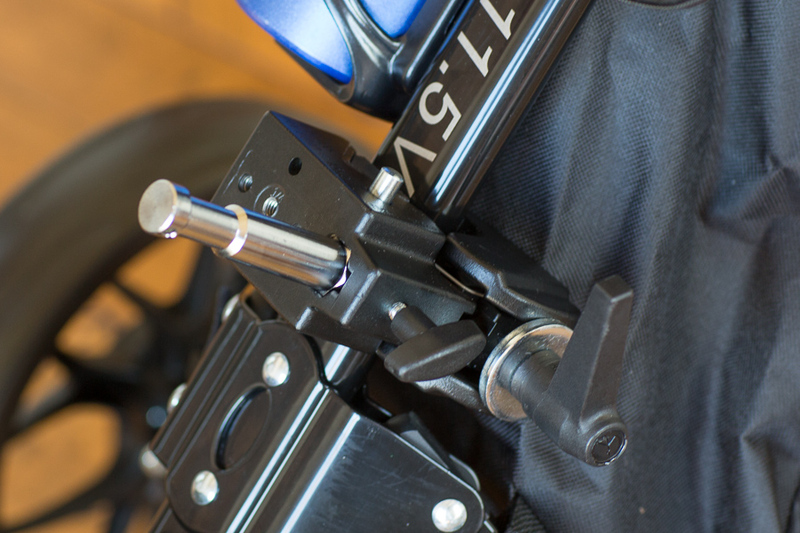 Before putting sticking the velcro, it’s a good idea to see where you will want to position the Superclamp. Make sure to tighten as much as you can without bending the shaft. This is what’s going to secure the reflector holder and softbox while they’re swaying in the wind. 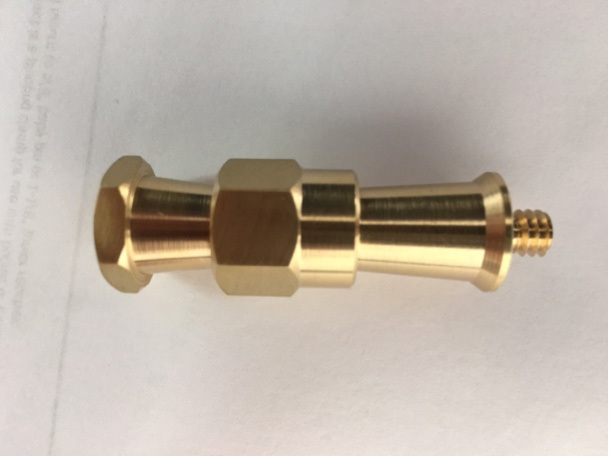 Connect the reflector holder to the stud and tighten. 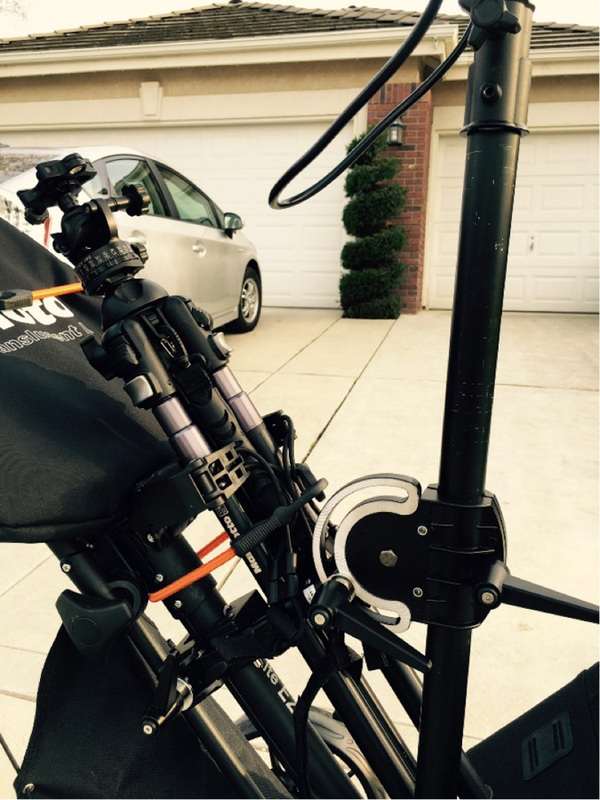 Straighten the post of the light stand. It should be vertical and touching the shaft at the bottom. Adjust the post to be about 6 inches off the floor. 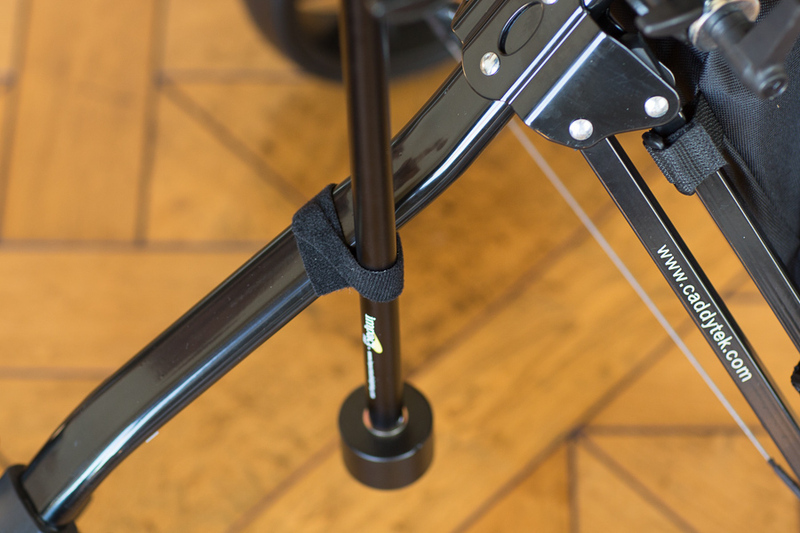 Secure the post to the shaft with a long strip of non-adhesive double-sided velcro (non-adhesive so that you can easily remove the light stand.) 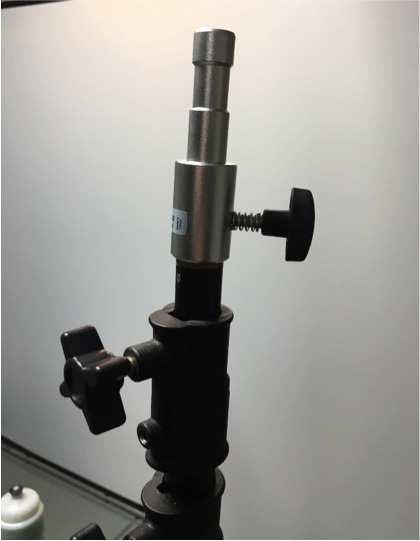 This will help limit sideway movement of the post and will put less pressure on the clamp. This is how everything should look connected. I’ll post some future enhancements that you can make to this solution to make it even more useful.